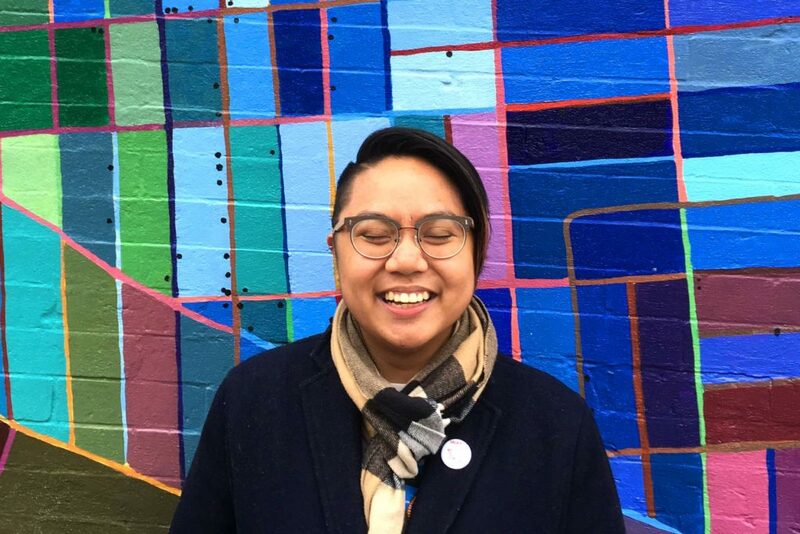 Angela Dumlao is a queer non-binary/genderfluid first-generation Filipinx-American theatre artist and activist dedicated to affirming and uplifting marginalized folx and their intersectional identities. They are the director and co-producer of the one-woman show Post Traumatic Super Delightful, which has been featured in Glamour Magazine's Top Ten College Women and Marie Claire Magazine. In addition to directing feminist theatre, Angela is a do-gooder for the consulting firm M+R, where they work on digital advertising campaigns for progressive non-profit clients such as Planned Parenthood. On the internet, Angela runs the Facebook page Call Me They, which was recently featured on Brit and Co. and Planned Parenthood's Pink Out / Power Up! newlsetter for their trans and gender non-conforming inclusive #ShePersisted viral memes. Angela's fashion blog, @menswearselfcare, features the intersection of queer fashion and radical self-care. Angela lives in Brooklyn with their partner, Caitlin. In this episode, which I just absolutely loved recording, Angela and I discuss self-care (and specifically where fashion and self-care intersect), imposter syndrome, and the value of aiming for progress over perfection. We dig into the need for gender-inclusive language in mainstream culture, and we talk about LGBTQIA representation and Angela shares personal stories of why representation matters. Angela also shares stories and ideas about how to be an effective ally for an oppressed or marginalized group, and the difference between true allyship and ally theatre that's just for show. To wrap things up, we talk about intersectional feminism, and why any movement (like feminism) needs to focus on more than just finding common ground - which often erases people who don't fit a certain mold. This conversation was so uplifting and educational for me personally, and I just know you'll love hearing from Angela as much as I did. Learned a lot ❤️ Do you know where I can find that James Bond reference Angela mentioned?